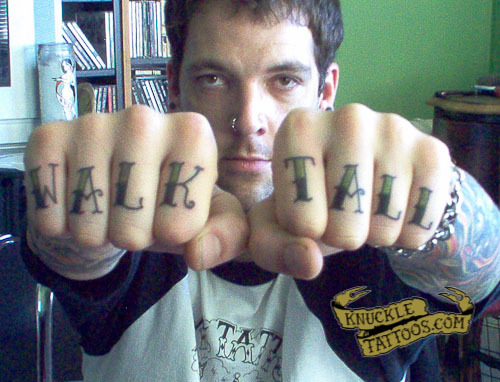 My kunckles were done by Eric Jones at Mom’s Body Shop in SF where i work as a body piercer. i’ve been trying to get tattooes that not only have a visual meaning, but a funny one as well. with my knuckles, i did some humor on my height. i’m 6 foot 8 and for most of my my life i hated my height. not untill i got into my late 20’s did i start to feel more comfortable about it.